We still have a few weeks of summer so I want to take advantage of the grill as much as possible. Keeping the heat out instead of inside the kitchen is always a good thing, plus who doesn’t love the smell of the smoking grill on a summer day. As I’ve mentioned before, the Mediterranean diet is super healthy, fresh and delicious, especially for those trying to avoid inflammation of the joints like my hubby. The flavors are so flavorful, yet light! I posted a recipe with chicken when we first launched the blog, but here’s a take on Mediterranean flavors with yummy seafood. Again, we have the opportunity of using my hubby’s freshly caught yellowtail! Who doesn’t love pasta? This is a yummy protein-packed pasta that you do not have to feel guilty about! The shrimp has protein, the pasta has protein, and even the yogurt has protein. It has a real kick too! Cheers to spicing up your life! I don’t think to make quesadillas often. But why not? They’re delicious, quick, satisfying, easy, and can be made healthy*. 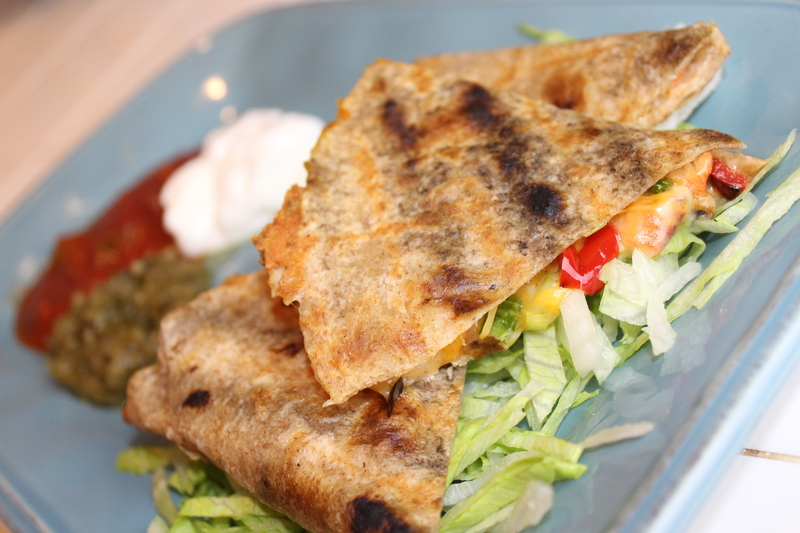 Note to self…make more quesadillas! Loaded with veggies, lean chicken, and made with healthy tortillas, these really are fit-for-you! And with the temperature being over 100 today, I didn’t want to cook inside. So once again, I used my grill. It was as easy as making quesadillas on the stove. So I encourage you all to use your outdoor grill more, especially when it’s super hot outside! Breakfast for dinner? Say whaaaat? And what’s easier than leftovers, right? It’s all about taking those leftovers and making something new…so I decided to do a healthy egg scramble for hubby and I. Honestly, my husband is not a fan of eggs. But this dish was so flavorful and had so many different textures, he loved it! There’s nothing better than being able to cook up and enjoy something that was freshly caught, especially when it’s from my own hubby. Dane took an overnight fishing trip to Mexico with his buddy Ernie a few days ago and brought home three Yellowtails! Now we have the opportunity to experiment with different Yellowtail recipes for days woohoo! The best way to really enjoy the flavor of the fish though is with simple preparation and ingredients. I especially love flavored herb butters to top the fish with. This is one of my favorites and it goes perfectly with any type of seafood and even vegetables.